Han Goeun has long been interested in the plight of disadvantaged peoples, both in Korea and throughout the world. In 2015, she was a member of her middle school’s Model UN club. As part of her research for this club, she read ‘Betting on Famine: Why the World Still Goes Hungry’, by Jean Ziegler, and was struck by the harrowing descriptions of people without steady access to food. As a result, she developed an abiding concern in the lives and welfare of international refugees. When Goeun began attending high school, she and several other students who shared her concerns founded a refugee policy study club called “Hearts and Hands”. Last year, Hearts and Hands undertook several activities attempting to make a difference in the lives of refugees. Goeun organized several fundraising activities, and helped open an informational booth aimed at educating her fellow students and fostering empathy and a sense of international solidarity. She also contacted the Africa Asia Development Relief Fund and the United Nations High Commission for Refugees, who kindly shared informational brochures and other goods, which Hearts and Hands could distribute throughout the school. Goeun also coordinated with the ADRF to determine what kinds of nutritional needs Syrian refugees have, so that Hearts and Hands could use the funds they had raised to donate the appropriate kind of protein bars to refugee camps. Goeun is also dedicated to helping the needy in Korea. Since 2015 she has volunteered at the local Children’s Center near her boarding school. She uses her dinner break to teach classes to the children of multicultural families there. She chose to teach classes on philosophy, since she feels that it is invaluable in developing critical thinking skills, and equipping young people to make good decisions. She teaches about topics like “Justice” and “Heroism”, in the hopes that her students will be able to make use of the class in their own lives. At first she struggled to teach such abstract material to such young children, and spent several months experimenting with different teaching strategies. Now she thoroughly enjoys the work, using activities like roleplaying and creative writing to help her students develop critical thinking skills. Goeun is most proud of her work lobbying for changes to Korean refugee laws. 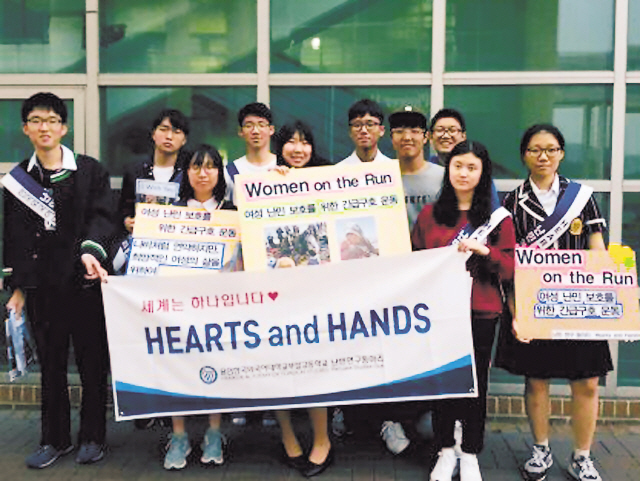 Since 2016, Hearts and Hands has worked to educate the public and collect signatures from students, parents, and community members aimed at changing the Refugee Act in Korea. They have collected hundreds of signatures so far, and plan to expand their operations in the near future. Goeun hopes that her political and teaching activities help spread empathy for refugees, and that one day she can make a difference in the lives of those who need it most.